I don’t often contribute to crowdsourced fundraising, but I did last night. I gave some of my graduate student stipend to the IndieGogo campaign to help The Brain Scoop and The Field Museum build a new diorama–striped hyenas. Why this diorama? and more importantly, Why did I give to this particular campaign? 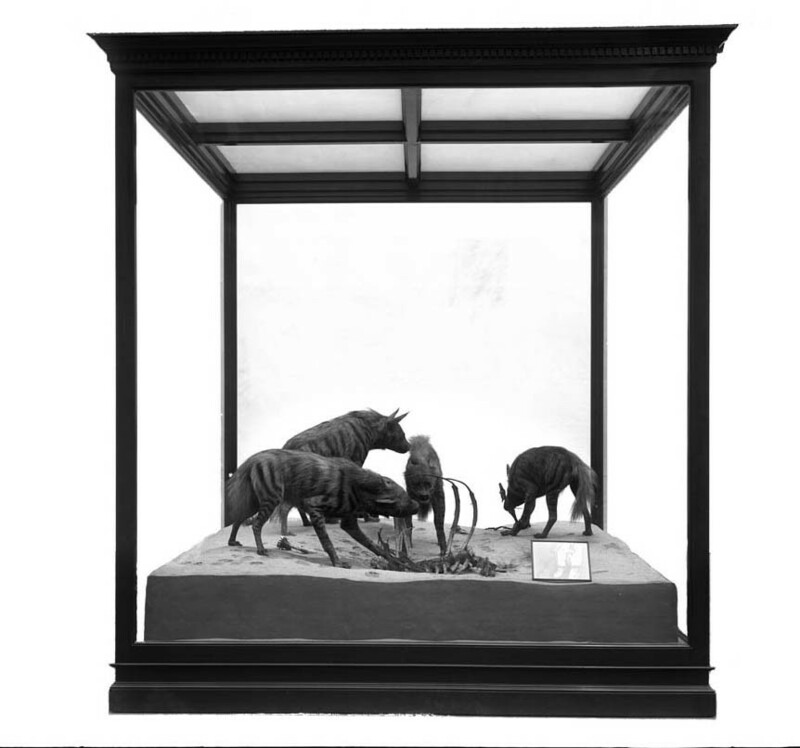 Emily Graslie, host of The Brain Scoop, makes the argument for this diorama, though her reasoning is largely historical: Carl Akeley was a great character; dioramas recreate a particular place that has all but disappeared; the number of hyenas has dramatically diminished. 1) Dioramas recreate a specific place. They have several parts that contribute to the realness of a place, including the painted, curved background, the plants, rocks, and floor in the foreground, and the taxidermy animals themselves. Early diorama creators, like Frank Michler Chapman, developed the technique to recreate disappearing places that had drawn the attention of conservationists, such as Pelican Island, among the last rookeries for brown pelicans. 3) Dioramas promote conservation. The irony of taxidermy is that it’s supposed to show us a specimen that is nearly lost. But in order to get that specimen into a museum, it must be killed, thereby depleting the species’ number by one (or more, if creating a group). This irony was not lost on Akeley, who then worked to develop protected areas, such as Albert National Park in Democratic Republic of the Congo (now Virunga National Park), where Akeley died in an expedition to study and collect mountain gorillas. This doesn’t answer why I chose to give to this particular project. It’s not often that we get to be a part of something that is (a) both scientifically and historically significant, (b) do it from a distance, and (c) watch the project grow, impacting millions of people. When I first visited the Field Museum in November 2014, I was struck by the odd placement of the hyenas—they don’t belong next to reptiles. What’s more is that I recognized the display as something of Akeley’s. I’ve been studying museum taxidermy for a while, since it’s the subject of my dissertation research, and the immediate recognition was exhilarating. In front of the striped hyenas, I knew that I could do this project, and that I had internalized the material to the point of identifying taxidermy styles and lines of influence. If you’re inclined, contribute to this cause. You don’t have much more time to give to the online campaign, but I hope you’ll help make the striped hyenas meaningful for decades (and centuries!) to come. *This, too, is problematic, as observation and creation are heavily influenced by anticipation of what we’re supposed to see. I’ll write about this in a later post. This entry was posted in dissertation, history of science and tagged diorama, field museum, natural history museum, taxidermy. Bookmark the permalink.